a little bit more camber on my AE86 road car, I grabbed a pair of TT132 (IIRC) LCA's. 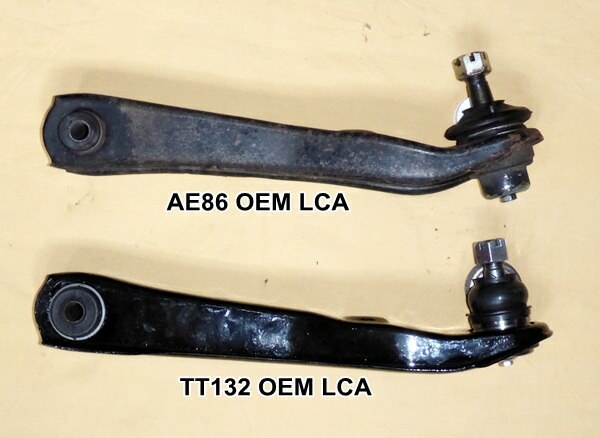 are the LCA's that are said to be 10mm longer than the stock AE86 LCA. shows why this is the only true measurement... due to the difference in ball joint angle. I have adjustable LCA's and from memory 10mm does add about 1°negative camber. 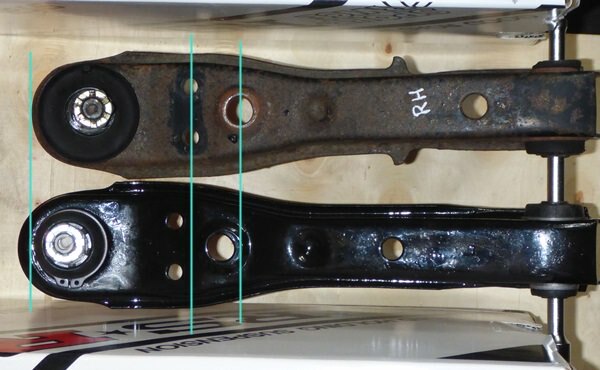 Two things to consider, one is obvious and that is to make sure you have enough thread adjustment on your steering tie rod ends. The other less obvious, make sure the alignment includes the caster setting. 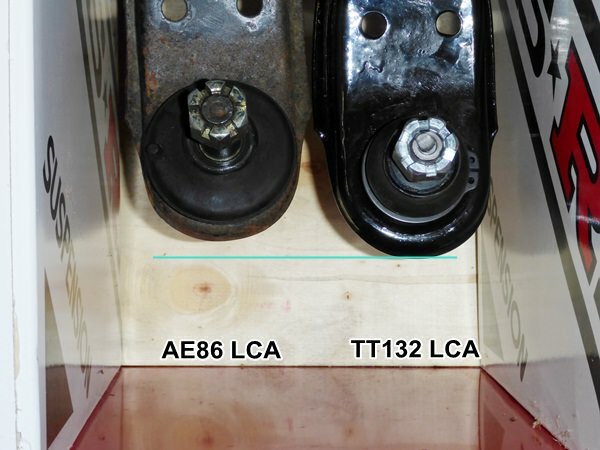 Lengthening the LCA changes the arc that it takes and to avoid having bump steer issues I ended up with about 0.75°less caster than when it had the standard length LCA's. point forward by around 5mm and increase the caster by maybe 1.5deg. the adjustable LCA's on the car ? You will have more suspension travel than I will have, so bumpsteer will be more noticeable. But I can dial out some caster in the short term if bad bumpsteer is immediately apparent. Best bet is to try it and as your car is lower you may find that one of the bump steer adjuster kits would work to dial out any bump steer. As my car is slightly higher than standard I need raise the steering balljoint and none of the available kits appear to allow for this. Remember that adding caster will increase dynamic camber, combine this with the increased camber from the longer LCA and you may end up with too much camber for good front grip, exactly what happened to my car. rod to accommodate the washers without any other mods. Do I dare be the one to mention NCRCA's on an 86 forum? No changes to tie rods, sway bars, tension rods, caster, or KPI. But I bet someone will want to argue scrub radius over all of that. a road car. So for an AE86 NCRCA's are really only applicable to race/drift cars.